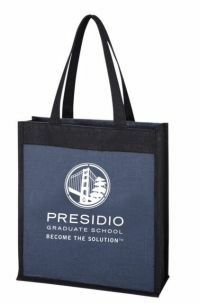 This campaign ended on June 15, 2018, but you can still make a gift to Presidio Graduate School by clicking here! Receive our gift of thanks: The PGS Executive Journal - Great for notes in important meetings!Elastic pen loop. Ribbon page marker. Includes 72 sheets of lined paper. If your vision is for a year, plant wheat. If your vision is for ten years, plant trees. If your vision is for a lifetime, plant people. We know that Presidio Graduate School students are unique. They master core competencies of a business education, but it's the heart and soul they bring to their work that creates sustainable change. With their experience and commitment, they go on to great things! Yet, many are prevented from joining the ranks of our graduates because they need our support. Excellent students with great ideas, their training at Presidio Graduate School will only enhance our future success as a community. Supporting our Annual Scholarship Fund, you can help create opportunities otherwise not possible for many. "As a mother of two young kids, it was a big decision to return to school and forfeit my paying job. Getting a scholarship from PGS was a huge boost in confidence and practical support for my continuing education. I am forever grateful to this school for its message, delivery, and accessibility. Today, you have an incredible opportunity to increase the diversity of our program and outcomes for students who might not otherwise be able to afford an education with us. By joining the Presidio Graduate School Annual Scholarship Fund as an investor, you will help create a more inclusive, diverse, and vibrant community to meaningfully put our shared values into action. Join us today as part of our circle of friends and together, we will lead the way. Thank you! P.S. Did you know? If you contribute at one of our leadership levels, you'll get a snazzy PGS gift!